Jessica's Island Tours was a design used for both shirts and pins. Jessica is pin-on-pin. She's wearing a bikini and grass skirt with flower lei's. The background is the beach with palm trees in the back. The sand is gold glitter filled. The water is a clear blue fill. 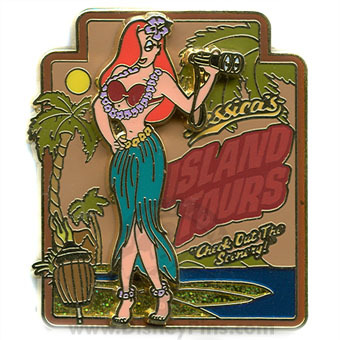 This is part of the Spotlight Island Collection, noted by the lit torch at the bottom left of the pin.